Are all horse racetracks just big ovals? Not at all! If you begin to explore the world of horse racing, you would quickly discover that horse races take place in an enormous range of venues. 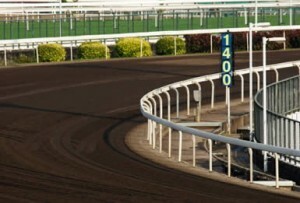 For example, there are the many famous and popular “flat” horse racetracks that do ask the horses and riders to race around an oval race course, but the lengths of these tracks can vary substantially. There are also steeple chasing, hunt, and harness racing venues, and most of these horse racetracks will look quite different from the traditional oval courses and include jumps, water, and more. It is also important to remember that the surfaces of the tracks can vary, and this is why a superior horse will have much different “odds” placed upon it depending upon the track where a race is being run. For example, a bookmaker will often use statistics on each of the horses running against one another in a race because the horses may have performed better or worse than normal at a particular track. Some bookmakers even take the anticipated weather into consideration based on the surface of the track as well. This is because a dirt track can become slick or difficult to maneuver when wet or a bit muddy, and some horses can easily overcome such an obstacle while others struggle with it. When someone decides to make wagers on horse racing, it does pay to gather as much information about each race as possible, and it should all start with the racetrack. The Internet is a great place for information of this kind, and using the odds created by the line makers and the handicappers is a great way to see if your research is accurate and likely to give good results. For instance, if you research a particular group of horses scheduled to run at a particular track, your information should match the horses with the “lowest” odds because you will easily discover which are the likeliest to win.